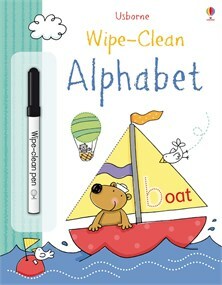 The Wipe-clean Alphabet is one in a wonderful series of interactive books to introduce young children to the alphabet and basic letter writing. The pages of the book are made from thick glossy card which is easy for little hands to turn, and are packed full of wonderfully cute, colourful and appealing pictures and illustrated scenes that children will love studying. The great feature of the book is that the pages of the book can simply be wiped clean, ready for writing on again. In our opinion, this is a really educational book for preschool children which teaches them about letters of the alphabet in a fun and uncomplicated way.